Climate models include numerous elements of Earth's climate system, such as clouds, rainfall, sunlight, sea ice, oceans, evaporation, and so on. These diagrams depict the evolution of climate models, and the features included in them, over the years. Early models (in the 1970s) were relatively simple; they used just a few key features (incoming sunlight, rainfall, and CO2 concentration) to represent Earth's climate system. Models grew more sophisticated over time, incorporating clouds, land surface features, ice, and other elements into their calculations. Simple oceans were included in models beginning around the time of the IPCC's First Assessment Report (FAR) in the early 1990s; later models include more complex representations of oceans. Current climate models include clouds, a broader range of atmospheric constituents (sulphates, aerosols, etc.) and atmospheric chemistry, vegetation that exchanges gases with the atmosphere, and other features. The FAR, SAR, TAR, and AR4 labels on the diagrams indicate the models in use at the times of each of the four IPCC Assessment Reports. Credits: Images courtesy of the IPCC (AR4 WG 1 Chapter 1 page 99 Fig. 1.2). 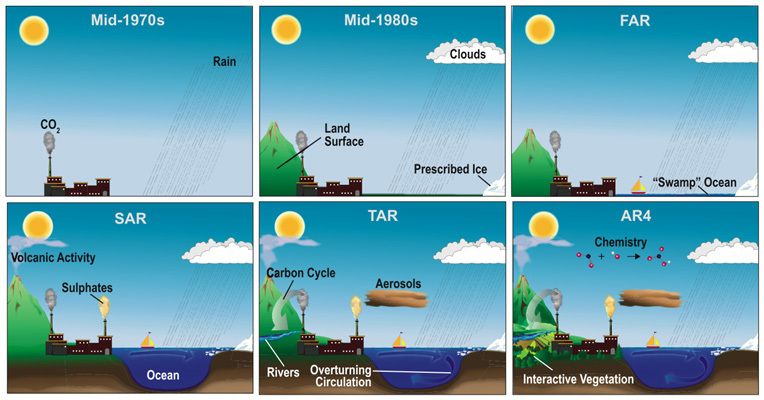 The image below illustrates the many components of a modern climate model, in this case NCAR's Community Climate System Model (CCSM). Components of a modern climate model - NCAR's Community Climate System Model. The various components are described below. Credits: Image courtesy of UCAR; illustration by Paul Grabhorn. These high, thin, icy clouds act as a warming influence on climate overall, because they allow sunlight in but trap long-wave radiation rising from Earth’s heated surface. The CCSM depicts these and other clouds throughparameterization - tracking the conditions that form such clouds and then specifying how much of a given rectangle of land in the model grid is covered by each cloud type. These low, dense, very reflective clouds act as a cooling influence on climate overall, because they reflect a great deal of sunlight. Subtropical oceans often feature huge areas of marine stratocumulus. The CCSM depicts these and other clouds through parameterization - tracking the conditions that form such clouds and then specifying how much of a given rectangle of land in the model grid is covered by each cloud type. These puffy clouds, which sometimes build in tower-like formations, are linked to strong updrafts and the showers and thunderstorms that result. Cumulus are difficult to represent in models because each cloud covers only a small part of Earth’s surface, but when taken together, cumulus clouds have a large influence on global circulation. The CCSM depicts these and other clouds through parameterization - tracking the conditions that form such clouds and then specifying how much of a given rectangle of land in the model grid is covered by each cloud type. The process of converting water vapor to water droplets or snowflakes releases heat into the atmosphere. The CCSM simulates this process, as well as the evaporation of water from soil, wetlands, lakes, and oceans and the amount of rain or snow reaching the surface. Sea ice helps keep polar regions cold, because it reflects most of the sunlight that hits it. When sea ice melts, it does not raise sea level directly (because the ice is already afloat, like a melting ice cube in a glass of water). However, the dark surface ocean exposed by melting sea ice absorbs most of the sunlight it receives, which leads to further warming. Research using the CCSM indicates that Arctic summertime sea ice may diminish greatly, as soon as the 2030s. One of the main elements of a climate model is its depiction of winds. The global circulation transports warm air poleward and cold air toward the equator. This flow operates through several persistent loops that produce trade winds in the tropics, westerly winds at midlatitudes, and easterlies across the poles. The actual winds at any one spot are influenced by day-to-day weather as well as climate cycles such as El Niño. Where winds converge, rising motion and rain or snow may develop. Because water has a higher heat capacity than soil, it takes longer for sea surfaces to warm up or cool down relative to the continents. Climate models must account for the transfer of heat between ocean and atmosphere. They also need to reflect changes in salinity (salt content) that occur as ocean water evaporates, or as fresh water enters the oceans through increased rainfall or increased glacial melting. Contrasts in temperature and wind are much stronger vertically than horizontally. Only a few miles above ground, temperatures are usually frigid (even in summer), and winds may howl at 200 miles per hour (320 kilometers per hour) or more. The CCSM divides the atmosphere into 26 layers, tracking each layer as well as exchanges of energy and moisture between layers. Near the ground, where vertical contrasts are strongest, the layers (which are defined by atmospheric pressure) can be as thin as 1,000 feet (about 300 meters) or less. The behavior of the ocean is much more difficult to observe than the atmosphere, and many ocean processes are still poorly understood. As recently as the 1990s, most climate models used a “slab” ocean—one that behaves as a single unit. Today, the CCSM and other sophisticated models include a much more dynamic depiction of the ocean that tracks changes in ocean currents, temperature, and salinity. These control such phenomena as the North Atlantic’s overturning circulation, which helps keep Europe warm for its latitude but which may be sensitive to climate change. Much like the atmosphere, the ocean needs to be divided into several layers in order for a model to accurately depict the three-dimensional flow and other qualities. The CCSM includes 40 ocean layers, ranging in thickness from about 33 feet (10 meters) near the sea surface to about 800 feet (250 meters) in the deep ocean. In order to accurately depict the ocean circulation in three dimensions, the CCSM includes undersea ridges, valleys, and other topographic features of the ocean bottom. Most of the world’s oceans outside the Arctic feature a relatively warm sea surface and a thin region called a thermocline that separates the warm surface layer from colder, deeper waters. In some parts of the world, colder and deeper water regularly crosses the thermocline to mix with warmer surface waters, or vice versa. The CCSM can simulate these overturning processes. Large mountain chains exert a major influence on temperature, precipitation, and wind patterns for miles around. Even when mountains are relatively modest in size or extent, they play an important role in local climate. Early climate models tracked the atmosphere at points separated by hundreds of miles, so mountain ranges appeared in highly smoothed form. The CCSM and other contemporary models operate at higher resolution so the topography is much less smoothed. The atmosphere is strongly affected by what lies beneath it - forests, deserts, ice sheets, mountains, and grasslands. The CCSM includes each of these elements, tracking the exchange of energy and moisture between them and the atmosphere. Urban areas are not yet depicted in the standard version of the CCSM or other global climate models, although work is under way to add them. Moisture stored near and just below ground level affects how much rain and snow can be absorbed by the soil and how quickly a region dries out if precipitation slackens. The CCSM includes a depiction of moisture in 10 soil layers. Virtually all of the energy that reaches our planet from the Sun leaves the Earth system in one form or another. In order to keep their simulation of Earth’s climate in proper balance, the CCSM and other climate models account for this outgoing radiation. To create an accurate portrayal of Earth’s climate, the CCSM calculates the amount of incoming solar radiation by location, time of day, and time of year. When reproducing past climates, the model can also include estimates of solar variability based on sunspot counts, carbon dating of organic material, and other indirect evidence. Besides melting, snowpacks can erode through a process called sublimation, in which moisture goes directly from ice crystals to water vapor in the atmosphere. Sublimation is common in dry mountain climates, where a snowpack may leave little or no water behind as it shrinks (even in temperatures below freezing). The CCSM depicts sublimation as well as snowmelt. When water evaporates, it draws heat from the lakes, rivers, or oceans from which it came and stores that heat within its molecular bonds. Heat can also leave the land and ocean surface directly through contact between the surface and molecules in the atmosphere (a process called conduction). The CCSM depicts these and other processes that move heat energy around the Earth system. Large areas of snow have a major effect on weather. Because of their light color, they reflect large amounts of sunlight and help keep temperatures colder than they would otherwise be, especially close to the ground. The CCSM tracks the seasonal waxing and waning of snowfall across mountainous and high-latitude areas. The large ice sheets in Greenland and Antarctica are also included. Some of the processes that control ice sheets are still being studied by scientists and are not yet part of the CCSM and other global models. A key part of the global water cycle is the flow of water from rivers, lakes, and land areas down toward the sea. The CCSM depicts runoff more precisely than earlier models, which enhances its treatment of the water cycle overall. Climate models use quantitative methods to simulate the interactions of the atmosphere, oceans, land surface, and ice. They are used for a variety of purposes from study of the dynamics of the weather and climate system to projections of future climate. All climate models balance, or very nearly balance, incoming energy as short wave electromagnetic radiation (visible and ultraviolet) to the earth with outgoing energy as long wave (infrared) electromagnetic radiation from the earth. Any imbalance results in a change in the average temperature of the earth. There have been major advances in the development and use of models over the last 20 years and the current models give us a reliable guide to the direction of future climate change. Computer models cannot predict the future exactly, due to the large number of uncertainties involved. The models are based mainly on the laws of physics, but also empirical techniques which use, for example, studies of detailed processes involved in cloud formation. The most sophisticated computer models simulate the entire climate system. As well as linking the atmosphere and ocean, they also capture the interactions between the various elements, such as ice and land (CRU). Climate models have been used successfully to reproduce the main features of the current climate; the temperature changes over the last hundred years, and the main features of the Holocene (6,000 years ago) and Last Glacial Maximum (21,000) years ago. Current models enable us to attribute the causes of past climate change, and predict the main features of the future climate, with a high degree of confidence (CRU). The most talked-about models of recent years have been those relating temperature to emissions of carbon dioxide (and other greenhouse gases). These models project an upward trend in the surface temperature record, as well as a more rapid increase in temperature at higher altitudes. Climate models are systems of differential equations based on the basic laws of physics, fluid motion, and chemistry. To “run” a model, scientists divide the planet into a 3-dimensional grid, apply the basic equations, and evaluate the results. Atmospheric models calculate winds, heat transfer, radiation, relative humidity, and surface hydrology within each grid and evaluate interactions with neighboring points. AOGCMs combine the two general circulation models, atmospheric and ocean. They thus have the advantage of removing the need to specify fluxes across the interface of the ocean surface. These models are the basis for sophisticated model predictions of future climate, such as are discussed by the IPCC. AOGCMs represent the pinnacle of complexity in climate models and internalize as many processes as possible. They are the only tools that could provide detailed regional predictions of future climate change. However, they are still under development. The simpler models are generally susceptible to simple analysis and their results are generally easy to understand. AOGCMs, by contrast, are often nearly as hard to analyze as the real climate system (Randall, 2007). Atmosphere-Ocean General Circulation Models are able to simulate extreme warm temperatures, cold air outbreaks and frost days reasonably well. Models used in Fourth Assessment Report (AR4 2007) for projecting tropical cyclone changes are able to simulate present day frequency and distribution of cyclones, but intensity is less well simulated. Simulation of extreme precipitation is dependent on resolution, parameterization, and the thresholds chosen. In general, models tend to produce too many days with weak precipitation (<10 mm day–1) and too little precipitation overall in intense events (>10 mm day–1) (Randall, 2007). The large-scale patterns of seasonal variation in several important atmospheric fields are now better simulated by AOGCMs than they were at the time of the Third Assessment Report (TAR 2001). Notably, errors in simulating the monthly mean, global distribution of precipitation, sea level pressure and surface air temperature have all decreased. In some models, simulation of marine low-level clouds, which are important for correctly simulating sea surface temperature and cloud feedback in a changing climate, has also improved. Nevertheless, important deficiencies remain in the simulation of clouds and tropical precipitation (with their important regional and global impacts) (Randall, 2007). Since the TAR, developments in AOGCM formulation have improved the representation of large-scale variability over a wide range of time scales. The models capture the dominant extratropical patterns of variability including the Northern and Southern Annular Modes, the Pacific Decadal Oscillation, the Pacific-North American and Cold Ocean-Warm Land Patterns. AOGCMs simulate Atlantic multi-decadal variability, although the relative roles of high- and low-latitude processes appear to differ between models. In the tropics, there has been an overall improvement in the AOGCM simulation of the spatial pattern and frequency of ENSO, but problems remain in simulating its seasonal phase locking and the asymmetry between El Niño and La Niña episodes (Randall, 2007). Excerpt from: Frequently Asked Question 8.1.Climate Models and Their Evaluation, In: Climate Change 2007: The Physical Science Basis, Chapter 8, pages 600-601. There is considerable confidence that climate models provide credible quantitative estimates of future climate change, particularly at continental scales and above. This confidence comes from the foundation of the models in accepted physical principles and from their ability to reproduce observed features of current climate and past climate changes. Confidence in model estimates is higher for some climate variables (e.g., temperature) than for others (e.g., precipitation). Over several decades of development, models have consistently provided a robust and unambiguous picture of significant climate warming in response to increasing greenhouse gases (Randall, 2007). Z. Chen, M. Marquis, K.B. Averyt, M.Tignor and H.L. Miller (eds.)]. Cambridge University Press, Cambridge, United Kingdom and New York, NY, USA. IPCC, 2007: Climate Change 2007: The Physical Science Basis. Contribution of Working Group I to the Fourth Assessment Report of the Intergovernmental Panel on Climate Change [Solomon, S., D. Qin, M. Manning, Z. Chen, M. Marquis, K.B. Averyt, M. Tignor and H.L. Miller (eds.)]. Cambridge University Press, Cambridge, United Kingdom and New York, NY, USA, 996 pp. IPCC, 2007: Summary for Policymakers. In: Climate Change 2007: The Physical Science Basis. Contribution of Working Group I to the Fourth Assessment Report of the Intergovernmental Panel on Climate Change [Solomon, S., D. Qin, M. Manning, Z. Chen, M. Marquis, K.B. Averyt, M.Tignor and H.L. Miller (eds.)]. Cambridge University Press, Cambridge, United Kingdom and New York, NY, USA. Year 2010 surface air temperature observations around west and south Greenland are unprecedented in the instrumental record. Year 2010 and year 2003 temperatures dwarf high yearly averages occurring in the 1920s and 1930s. Fig. 1. 170 years of annually resolved whole Greenland ice sheet averaged surface air temperature from a reconstruction driven by a statistical fusion of long term meteorological station data with calibrated regional climate data assimilation model output (Box et al. 2009). A pink circle denotes the record setting year 2010 value.The thick gray line is a 31 year two-tailed Gaussian-weighted smoothing of the annual values. As the "boxcar" gets within 15 years of the beginning and end of the series, the "tail" that runs into the end of the series is cut off and the weighting shifts accordingly. Over the full 171 years (1840-2010) of the reconstruction, the ice sheet average surface air temperature increased 1.26 C. The warming rate was 0.74 C/century. The recent 17 year Greenland ice sheet warming rate is 30% smaller in magnitude than a 17 year period in the 1920s. 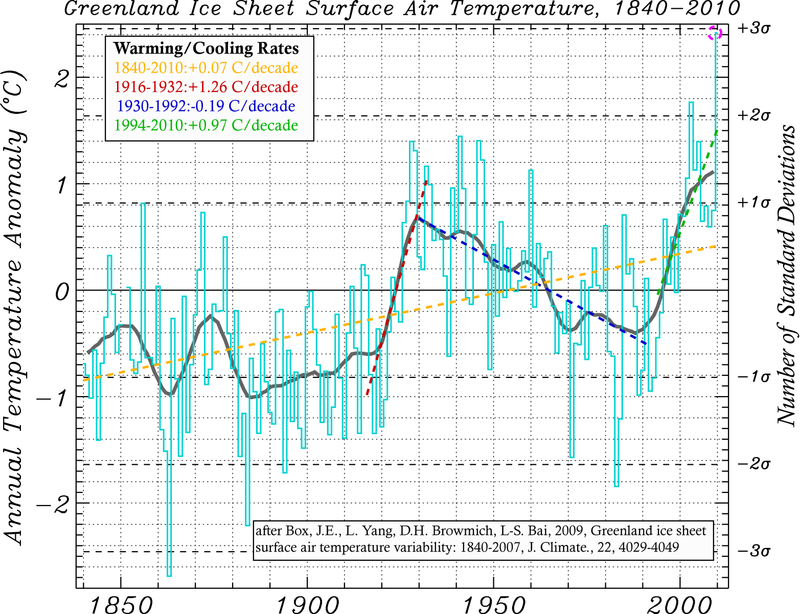 The intervening 63 year period (1932 to 1992) was cooling at -0.19 C/decade. This cooling can be attributed to a cooling phase of theAtlantic Multidecadal Oscillation (AMO) (e.g. Schesinger et al. 1994; Trenberth et al. 2006). Cold episodes in 1983-84 and 1991-92 enhance this cooling trend and are caused primarily by major volcanic eruptions (see Box, 2002) . West Greenland is a focus of sulfate aerosol-induced cooling (see Box et al. 2009). Another contributor to the 1932 to 1992 cooling is global dimming, that is, cooling at the surface induced by increases in atmospheric aerosols. Liepert et al (2002) estimated that there was globally a reduction of about 4% in solar radiation reaching the ground between 1961 and 1990. The Wikipedia Global Dimming article is worth reading. The recent (post-1994) warming, is attributable to: 1.) a growing absence of sulfate cooling because there has not been a major volcanic eruption since 1991; 2) recent warming phase of AMO; 3) an apparent reversal of the global dimming trend; and 4) ongoing and intensifying anthropogenic global warming (AWG), the elephant in the room, owing to a dominance of enhanced greenhouse effect despite other anthropogenic cooling factors such as aerosols and contrails (IPCC, 2007). The primary factor responsible for the warming trend is very likely to be AWG (IPCC, 2007). Fig. 2. Three long term Greenland meteorological station records, illustrating the long term time series of yearly-average temperatures. Triangles denote record setting values coinciding in 2010. Also interesting to note is the strong 1983-1984 El Chichon volcanic cooling (see Box 2002). It is scientific to question if year 2010 record setting temperatures are real or due to some spurious aspect of the measurements. Former television meteorologist Anthony Watts, for one, expended quite a lot of effort to discredit apparent record setting 2010 temperatures in Nuuk, Greenland. However, Watts seems in error, as one would not expect the same pattern at other locations and in independent periods of time (Fig. 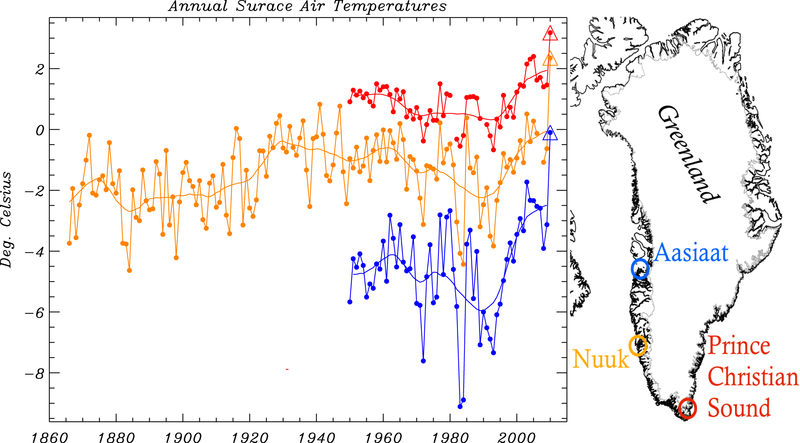 2), if the Nuuk 2010 temperatures are spurious. Rather, record high temperatures are evident at other Greenland stations in the same months, for example, in May, August, September, November, December 2010. Watts implicates the fact that the Nuuk measurements are near an airport to discredit the anomalous year 2010 values. Heat spewing from airplanes seems a valid concern and incidentally Aasiaat measurements are also from the grounds of an airport. However, the Prince Christian Sound (a.k.a. Prins Christian Sund) data are not obtained from near any airport (J. Cappelen, DMI, personal communication). We are fortunate to have continuous temperature records from Greenland’s capital Nuuk beginning in 1866 in addition to century-plus records from other locations in Greenland (Box 2002; Vinther et al. 2006; Cappelen 2010; Box et al. 2009), providing instrumental climate records rivaling many of the longest records on Earth. I have used these data record and others available from the Danish Meteorological Institute and NASA to reconstruct Greenland ice sheet average surface air temperatures (see Box et al. 2009). I update the Box et al. (2009) reconstruction and make further analysis in this blog entry. This work is in preparation for my 7th consecutive annual Greenland entry for the Bulletin of the American Meteorological Society’s “State of the Climate” report published each June. Intergovernmental Panel on Climate Change (IPCC) (2007), Climate Change 2007: The Physical Science Basis, edited by S. Solomon et al., Cambridge Univ. Press, New York. Liepert, B. G. (2002), Observed reductions of surface solar radiation at sites in the United States and worldwide from 1961 to 1990, Geophys. Res. Lett., 29(10), 1421, doi:10.1029/2002GL014910. Of the 31,478 scientist signatories to the Global Warming Petition Project under Qualifications of Signatories, only 0.12% or 39 designate having their primary education in “Climatology”. That’s 12 people in 1000. Un-credible. To help avoid the most dangerous consequences of climate change, ranging from extreme heat, droughts, and storms to acidifying oceans and rising sea levels, the United States must play a lead role and begin to cut its heat-trapping emissions today—and aim for at least an 80 percent drop from 2005 levels by 2050. Blueprint policies lower U.S. heat-trapping emissions to meet a cap set at 26 percent below 2005 levels in 2020, and 56 percent below 2005 levels in 2030. The nation achieves these deep cuts in carbon emissions while saving consumers and businesses $465 billion annually by 2030. The Blueprint also builds $1.7 trillion in net cumulative savings between 2010 and 2030. Blueprint policies stimulate significant consumer, business, and government investment in new technologies and measures by 2030. The resulting savings on energy bills from reductions in electricity and fuel use more than offset the costs of these additional investments. The result is net annual savings for households, vehicle owners, businesses, and industries of $255 billion by 2030. Under the Blueprint, every region of the country stands to save billions. Households and businesses—even in coal-dependent regions—will share in these savings. Anti-science climate change deniers are slowing progress that will leave the US behind economically/technlogically. Though it is obvious why clean energy will create next-generation jobs for Americans while stimulating the US economy, for further reading, see this Union of Concerned Scientists article. Science academies’ statement on climate change “It is essential that world leaders agree on emissions reductions needed to combat negative consequences of anthropogenic climate change,” national science academies from 13 countries declared in a joint statement issued on 11 June . The statement, issued by the academies of the G8 countries—including England, France, Russia, and the United States—and ﬁve other countries (Brazil, China, India, Mexico, and South Africa), came in advance of a G8 meeting in Italy in July and prior to United Nations Framework Convention on Climate Change (UNFCCC) negotiations in Denmark in December. “The G8+5 should lead the transition to an energy efﬁcient and low-carbon world economy, and foster innovation and research and development for both mitigation and adaptation technologies,” the statement noted. The academies urged governments to agree at the UNFCCC negotiations to adopt a long-term global goal and short-term emissions reduction targets so that by 2050 global emissions would be reduced by about 50% from 1990 levels. The academies also called for a signiﬁcant increase in fundamental international research on climate, low- carbon, and climate- resilient technologies, and on ways to protect natural systems in the face of climate change. “The need for urgent action to address climate change is now indisputable,” according to the statement. Citation: Showstack, R. (2009), In Brief: Science academies’ statement on climate change, Eos Trans. AGU, 90(25), doi:10.1029/2009EO250004. The deniers’ main arguments don’t hold water. In other words, there have been no acceptable arguments by AGW deniers that human activities taken globally, on (usually decadal) average (not shorter), can not significantly influence climate. I am a credible expert. I have a PhD certificate in atmospheric and oceanic science. I have taught numerous university-level courses in meteorology and physical climate science. Lemme tell you, a great way to understand the science is to teach it over and over! I am a tenured professor of climate science. I am a contributing author to the 2007 Nobel Peace Prize-winningIntergovernmental Panel on Climate Change’s Fourth Assessment Report. I have published 26+ peer-reviewed publications directly related to climate science. While the vast majority of climate scientists and national policy makers have dismissed human-induced global warming deniers attempts at debunking (human-induced) global warming science, there remain many undecided folk. Thus, some debate is worthy of my time. Given the maturity of the science and what’s at risk (the livelihoods and economies of present and future generations), policy makers must act, even accepting the apparently very small odds catastrophic climate change won’t happen. Civilizations weigh the odds while hoping for the best yet prudently prepare for the worst. I want to help civilization achieve sustainable development. Putting the deniers in their place (evidently as pseudo-scientists) makes the world a better place. The IPCC Fourth Assessment Reports and in particular the rather dense IPCC FAR 2007 Summary for Policy Makers. Please beware that while most of the earlier IPCC reports’ conclusions have not changed, you should consider the advancements in science since earlier reports to supercede the earlier results. Finally, be aware that there remain uncertainties. Understand that predicting future climate is a very complex problem that has engaged many of the worlds brightests atmospheric and climate scientists. Me stating that uncertainty exists does not mean that climate scientists lack crediblity, the ranks of climate scientists contributing to international assessment reports include Nobel prize winners, national science medal winners, heads of academic and governmental departments, and many who are deeply patriotic, skeptical, and caring for the world’s challenges. Me stating that uncertainty exists does not mean that climate science has not made major advancements in knowledge, climate scientists have. Don’t let the 1970s global cooling scare discredit advances in science since! Me stating that uncertainty exists does not mean that climate science has not provided projections of future climate worthy of policy response, climate science has made useful and honest projections, again, see the IPCC FAR 2007 Summary for Policy Makers. Again, given the maturity of the science and what’s at risk (the livelihoods and economies of present and future generations), policy makers must act, even accepting the apparently very small odds catastrophic climate change won’t happen. Civilizations weigh the odds while hoping for the best yet prudently prepare for the worst. If Wagner read the published peer reviewed science that IPCC summarizes, he’d know that direct observations from balloon soundings show that The average atmospheric water vapor content has increased since at least the 1980s over land and ocean as well as in the upper troposphere. The increase is broadly consistent with the extra water vapor that warmer air can hold. See IPCC 2007 Chapter 3Section 3.4. Meanwhile, CO2 concentrations are also increasing. Elevated CO2 concentrations have an associated net warming affect on climate. Of all the “well mixed” greenhouse gasses, CO2 has by far the largest warming effect. See figure SPM.2 in the IPCC 2007 Summary For Policy Makers. Climate change deniers seek holes in the science instead of seeking the truth. The science by definition aims for truth. There is no conspiracy. Climate change deniers waste the time of climate scientists and block progress. We should instead be united to protect future generations from our trashing of the environment. United we stand, divided: the rest of the world sells us technologies America should sell them. Human-induced climate change deniers confuse weather and climate. It’s actually simple…. Climate is the long term average state. Weather is ther short term state.